It follows the adventures of four childhood friends, who having reached their mid thirties, have discovered that they aren't quite where they'd like to be in life, either professionally (in some cases) or romantically (in all cases). Phil (Keith Robinson) struggles gamely along as a hard working water delivery driver and extremely dedicated father and husband, who silently suffers and broods over his wife Coco's (Jill Marie Jones) intensely disrespectful and dismissive attitude. Zenobia (Nicole Ari Parker) is an unmarried local TV sports anchor who is always getting hit on by obnoxious entitled sports stars like Nick West (Darius McCrary), but is so picky that she worries she may have priced herself out of the marriage marketplace. Victoria (Tamala Jones) is married but it's not exactly a happy union as her husband Austin (Dondre Whitfield) has done just about everything short of taking out a newspaper ad to announce to the world that he does not want children. Victoria wants children very badly. The group's last member is Cleavon (Kevin Hart). He's a single man who doesn't really have romantic problems because he's usually too shy to talk to a woman, let alone convince one to be his girlfriend. There's also the little matter of Cleavon not having a job. He makes his living by legal but rather pathetic methods (this is the source of much of the movie's cheap humor and was actually used a few times too many). Mike Epps and Wendy Raquel Robinson also provide laughs as a perpetually battling and reconciling couple who live across the hall from one of the four major characters. Is there anyone who does deadpan better than Mike Epps? 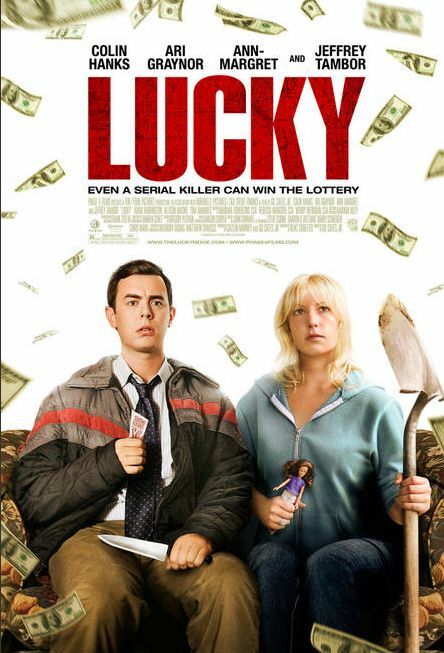 The normal way to describe independent films like Lucky is to say that they are quirky. So, yes this is a quirky film. It's weird. It's offbeat. It's clapping on one and three in one measure and two and four in the next. It worked for me, not just because of the acting which is never anything but natural but also because of the writing which takes a LOT of chances. Not all of them pan out but enough do. So I thought the film was worth mentioning. Similar to 35 and Ticking, this is not a big budget movie. However because I liked the writing and acting I never noticed any other issues. Lucy (Ari Graynor) is a plain jane executive assistant at an accounting firm. She is also the side dish of one of the firm's up and coming young partnership track go-getters. Lucy is a very material sort of girl. She's not deceptive. She's just open and honest about being attracted to male ambition, status and money. Lucy's childhood acquaintance Ben (Colin Hanks-who looks almost exactly like his Dad) also works at the same firm but he's even lower on the totem pole than she is. He delivers mail and fixes printers. Ben has always carried a torch for Lucy but she only notices him when he's in her way. Well life is like that sometimes. Ben is a wimp and loser. Lucy doesn't go for wimps or losers. Ben has no ambition or status. And he certainly doesn't have any money. But things suddenly change. Lucy's paramour thinks he can do better and drops her. This sets her off in a ranting screaming temper tantrum. Lucy is later terminated when she decides to crash a meeting chaired by her former flame so that she can share some highly unpleasant personal and sexual details with everyone in the room. But soon after her termination, Ben wins $36 million in the lottery. Dollar signs in her eyes, now it's Lucy who starts doing her best to show up on Ben's radar. This doesn't take long, as Ben is pretty desperate to have female intimate contact. He still lives with his enigmatic mother Pauline (Ann-Margret in a role that shows that for some women beauty fades with age but never quite disappears). In short time, Lucy and Ben are married and have a regal home of their own. For most stories that would be the end but not here. This is a British sci-fi/horror/comedy film that combines some social criticism with alien invasion and "kids save the world" storylines. This can occasionally be jarring as the film lurches back and forth between very explicit R rated violence, humor directed at or about children, understated sarcasm, and sci-fi cliches. 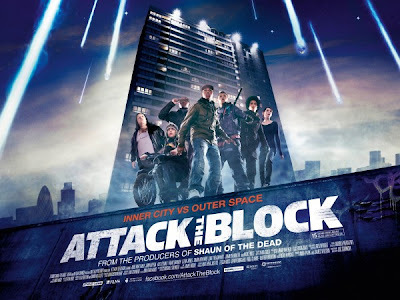 It takes place primarily in and around a South London council estate, what Americans would recognize as "the projects" and what the residents refer to as "the block". 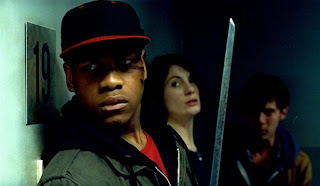 A multiracial group of teen thugs, led by Moses (John Boyega), mugs a young white woman Samantha (Jodie Whittaker), who had just moved into the block. The mugging of Samantha is interrupted by a car crash which heralds the arrival of a tiny (3 foot) alien creature, which is quickly and efficiently beaten and stomped to death by the gang. Sam takes the opportunity to escape and call the police. Eventually the police arrest Moses (his mates escape) and he is identified by the outraged Sam. However, while Moses is being packed away into the police van a new alien group arrives in force. These aliens are much larger and nastier. They're either the adult or male counterparts of the alien that was killed. They want payback. They kill the police and only miss killing Moses because of the intervention of Sam and his gang. The aliens start to rampage in and around the block, looking for the kids. For these kids an alien invasion is just another day at the office as they already spend their time trying to avoid run-ins with bigoted police and violence prone older gangsters. They especially want to avoid the brutish Hi-Hats (Jumayn Hunter), the murderous local top hoodlum who is exactly who Moses will be in about half a decade or so if he doesn't smarten up. There was an unfortunate misunderstanding with Hi-Hats. So in addition to the aliens, Hi-Hats is also hunting the teens. Time will tell if Moses, his group, Sam and a few comic relief young kids looking to make a name for themselves can hang together and survive the night. This movie wasn't as smart as it thought it was. There are more than a few holes in logic and pacing. 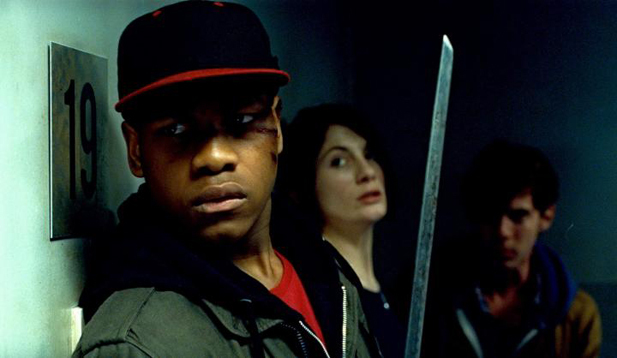 I wonder if Boyega can avoid future typecasting as a surly thug. Sometimes sequels are better than the original but usually not. Despite an interesting beginning and good premise, this movie wasn't as good as the original. The original itself was a remake of the Spanish film Rec. When I was growing up in the Pre-Cambrian era, flight attendants were called stewardesses. They were generally younger attractive women. Unfortunately (from my POV) before I was old enough to do anything about this, times changed and so did the demographic profile of stewardesses flight attendants. It happens. 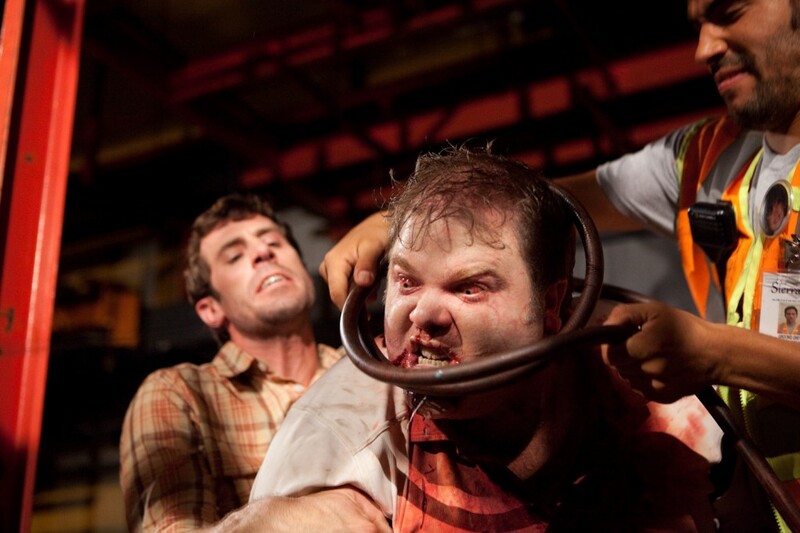 Quarantine 2 evidently takes place in an alternate universe where nothing like this took place. Two young shapely stewardesses are in the back of a limo being driven to the LAX airport. They are changing clothes and putting on makeup as evidently they are also groupies, who just did the usual activities to get backstage and party with their favorite rock band. I always thought that's what stewardesses did in their spare time and now I have proof. The brunette, Jenny, (Mercedes Masohn) who is the only actor I even care to identify by name here, is tasked with watching over a young teen passenger (of course he's too smart for his age) who is visiting one of his divorced parents. She and her blonde partner in crime also make goo-goo eyes at the young doctor on the plane. The rest of the plane's passengers pretty much touch on all the demographic cliches-there's old cat lady, old couple, yuppie scum couple, fat guy, foreign couple, black chick, black guy, and maybe one or two others I've forgotten. BTW, if your name is black chick or black guy in a cheap horror film, you probably won't make it out alive. Just some friendly advice. What do you mean no more peanuts!! !